November is the start of hibernation. The evenings are drawing in and at the weekends we tend pull up the drawbridge and gather around the log fire. We've been reading a lot more and our books this month include: Ian Rankin - Resurrection Men; JP Taylor - Shadowmancer; Michael Frayn - Spies and Iain Banks - Dead Air. Heard it through the Grapevine - Marvin Gaye; All Right Now - Free; Sledge Hammer - Peter Gabriel; Sailing to Philadelphia - Mark Knopfler; Factory Girl - Rolling Stones; Sympathy for the Devil - Rolling Stones. "Mellow mists and fruitfulness..." give us an opportunity to go on a few walks. 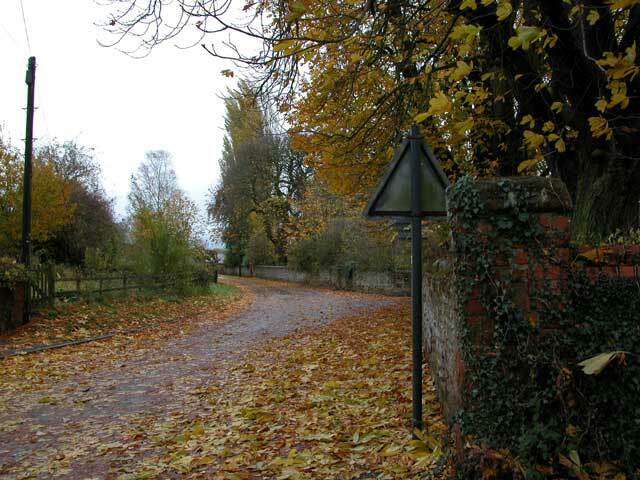 We have this particular walk from the house that cuts across country to East Hunsbury. 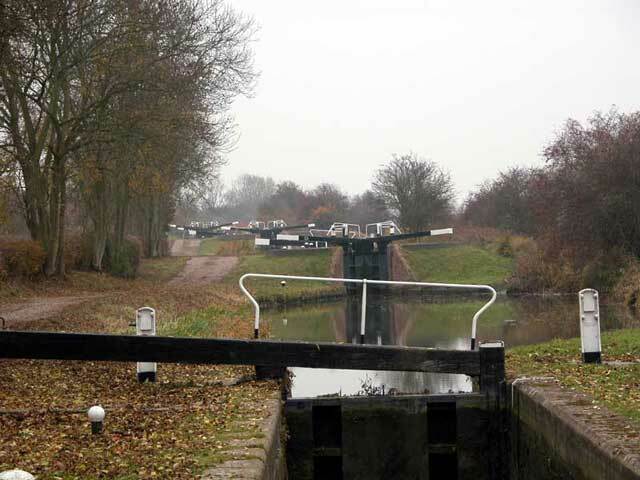 It crosses the Rothersthorpe flight of locks as seen here looking up the Northampton arm. The M1 is about 200 metres behind us. This walk was somewhat memorable because we discussed the music we would have at our funerals. A possible for Jane would be Tracy Chapman's "kick the bucket" and Steve went for Sting's "let your soul be your pilot". 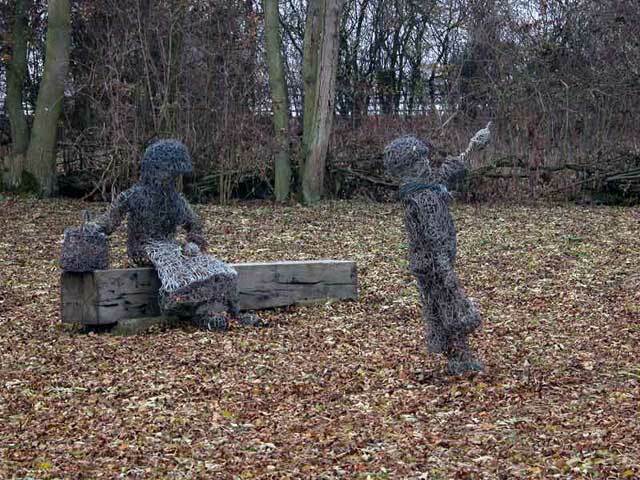 British Waterways have livened up the towpath with these wire figures. They are really exciting characters just on the edge of the canal in a leafy clearing. Shortly after passing this we had to cross the busy A43. If we'd been badgers they would've built a tunnel but mere human beings on a footpath had to risk life and limb with cars travelling at 50+ miles and hour. There are some very large horse chestnut trees on the way out of the village and in Autumn they give a superb display of falling leaves. On this particular morning after a fairly windy evening the road was covered with dry leaves, the kind that we used to kick through as kids in the park. We both agree that Autumn and Spring are our favourite times of year. We did manage to get to see Love Actually in the middle of the month. The critics have not given it a good reception because it was soft and sickly but to anyone who is thinking of going to see it, ignore the critics. Of course it is soft and sickly but it's also hilarious and sad and you leave the cinema feeling really good. Yes it's got a feel good factor that goes off the Richter scale but there's nothing wrong with that. 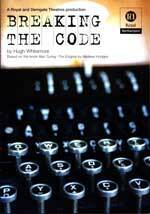 Our other culture fix was to go to the Royal Theatre in Northampton to see Breaking the Code. This is a drama based on the life of Alan Turing, brilliant mathematician, code breaker, originator of computer theory and homosexual in the 1940's and 50's. Turing's life was exceptional in terms of his achievements at Bletchley Park but his life was complicated by his homosexuality at a time when it was illegal. The acting and scene setting were brilliant and left a lasting impression. This has to be one of the best productions we've seen at the Royal for a very long time and has revived our interest in local theatre - we were beginning to be spoiled by the productions of the Royal Shakespeare Company at Stratford.